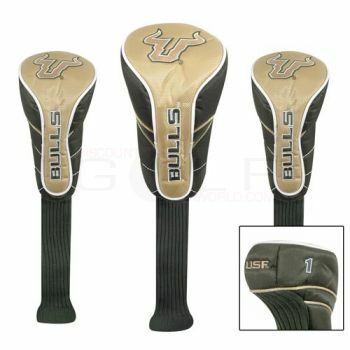 Set of three headcovers, constructed of durable nylon, features expandable socks that provide maximum shaft protection. Set of three headcovers, constructed of durable nylon, features expandable socks that provide maximum shaft protection. Three different sizes ensure a proper fit on your clubs and the #1 headcover is designed to fit up to a 460cc driver. Embroidered with three collegiate trademarks on each headcover. Embroidered numbering system of 1, 3 and X. Packaged in hangable clamshell with insert. The full manufacturer's warranty from Team Effort is only valid when the Team Effort Collegiate Set of Three Nylon Headcovers is purchased from an Internet Authorized Dealer. We will match any Internet Authorized Dealer's best price on the Team Effort Collegiate Set of Three Nylon Headcovers. The Team Effort Collegiate Set of Three Nylon Headcovers may be referred to by the following terms: 141NG3, 723141411411.